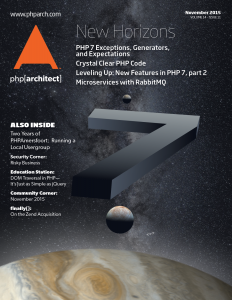 Are you as excited for the PHP 7 release—scheduled for this month as we go to print—as I am? I’m sure you are. This major release brings significant new features to our favorite language, and huge performance improvements. Just like we can’t point to one single event as the cause of the European Renaissance, many factors have contributed to the PHP Renaissance of recent years. PHP 7 continues this legacy and brings important new capabilities for us to use. Now, it’s up to us to continue expanding the reach of the PHP community by investigating new solutions, sharing what we learn by writing and speaking, connecting with other communities, and welcoming new folks with open arms.